Ontario 49, a Canadian mid-range lottery, offers familiarity with a dose of the unexpected. Based on the 6/49 lotto format, it’s easy to learn the mechanics of this game, while features like the Encore and Combination Play keep things fresh and exciting. More than that, Ontario 49 also features a fixed $2M jackpot, bi-weekly draws, and tax-free lump sum payouts. What else does it have on tap? Join me as I dive deeper and see what makes Ontario 49 tick! Ontario 49 was launched in 1997, with its first ever draw being held on October of that year. Since April 2000 up to today, the game has been operated by the Ontario Lottery and Gaming Corporation (OLG). For the most part, the core concept of the game has more or less remained the same since its launch. On May 2014, however, several tweaks to the mechanics were introduced. Jackpots were now at $2,000,000, and the chances of winning any prize greatly improved—from 1 in 54 to 1 in 6.6. These changes, along with new prize categories, were seen as welcome changes as they improved Ontario 49 by a great deal. Fixed Jackpot: Unlike other lotteries, Ontario 49 jackpots are of a fixed amount. Good thing is it’s a pretty sizable sum: CA$2,000,000. Bi-Weekly Draws: Draws are held every Wednesdays and Saturdays, so you get two chances to win per week. Familiar Mechanics: Ontario 49 draws from the classic 6/49 game format so both novices and veterans alike should have no problems learning the ropes. 7 Prize Tiers: Ontario 49 features seven prize tiers you win in—where the minimum requirement to win a prize is by matching only two numbers. Tax-Free: All Ontario 49 prizes are 100% tax-free at the source. How Does Ontario 49 Work? As I mentioned previously, Ontario 49 is based off the oft used 6/49 lottery format. To old hats, playing this game should be second nature. However, if this is your first time playing the lottery, it’s pretty easy to learn. To play, you must pick six numbers from a selection range consisting of the numbers 1 to 49. In addition, a bonus number is also selected—which is used to determine some lower-tier winners. Speaking of winning, you must match all six numbers to bag the top prize. Meanwhile, matching only five plus the bonus number will award you the second prize tier. In total, there are seven tiers you can win in. If you’re playing without the help of an online lottery site (i.e. you’re purchasing straight from lottery retailers in Ontario), you can also opt to play the Encore. For an additional CA$1, you will get entry to this bonus game that gives you the chance to win prizes up to CA$1,000,000. You can also add a Combination Play ticket if you want to win multiple prizes. Combination Play tickets work the same as regular tickets, but these let you play more numbers in the form of five to nine-number combinations. So, if you activate this feature, it will increase your chances of winning. Prices start at $44. If you win in either of the first two tiers, take note that prizes are divided equally should multiple winners come forward. Thankfully, Ontario 49 prizes are paid out as a lump sum and are 100% tax-free, so you won’t have to worry about other deductions. That said, if you aren’t from Canada you may have to deal with your local tax laws. Similarly, if you played Ontario 49 using a lottery agent service, take note that some services might withhold a percentage of your winnings as commission. Winners have a year from the draw date to come forward and claim their prize. In the event that prizes go unclaimed, the provincial government will use the funds for various projects that will benefit Ontario residents. In 2012, a group of friends decided to try their luck on the Ontario 49 game on a whim—only to end up winning CA$1,000,000! Each of the members of the group took home around CAD$47,619. Two entities ensure that Ontario 49 adheres to operational and legal standards. The lottery itself is run and operated by the Ontario Lottery Corporation, which is a part of the Interprovincial Lottery Corporation. The core mechanics of Ontario 49 has largely remained the same since its inception—save for prizes getting bigger, new prize categories being added and odds getting better. Ontario 49 utilizes a traditional, mechanical lottery machine to for drawings instead of an automated computer pumping out numbers. Are YOU ready to win CA$2,000,000? Ontario 49 has a lot of good things going for it. The simple mechanics based on the 6/49 format make it easy for anyone to learn this game in no time, while the various modes of play keep things fresh and exciting. Of course, it also helps that prizes are paid out in cash and are tax-free at the source. While some of the prizes are unimpressive—even with the bonus number matched—the jackpot is quite good for a fixed prize. All in all, Ontario 49 is one lottery game definitely worth checking out. I also received an email from Mrs Marshall publicity secretary of Canada / UK lottery and she send an email for confirmation, how true can it be? Hi Hussaini, that definitely looks like a scam. If you’d like to make absolutely sure, please reach out directly to the Ontario Lottery and Gaming Corporation. I am from Nigeria. I received an email saying that my email is attached to a winning ticket and i didn’t purchase any ticket, is that email to be trusted? It stated that they have picked from a wide selection of emails and mine was one of those who won. To claim the winnings I must fill out basic information and i should contact their agent in South Africa. How are my going to be sure its real? That is most definitely a scam. Don’t fall for it! Legitimate lotteries don’t give out prizes to people who didn’t purchase tickets. You can read more about the different scams here. 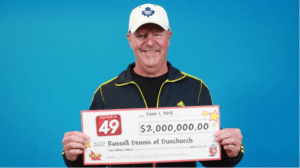 If you used a lottery site to join Ontario 49, they should have a claiming process in place. You can also get in touch with OLG, the gaming corporation running Ontario 49, by calling this number: 1-800-387-0098. However, it must be noted that if you didn’t play Ontario 49 at any point in the past, then it is most definitely a scam–beware! I received an email saying that my email is attached to a winning ticket, is that email to be trusted? It stated that they have picked from a wide selection of emails and mine was one of those who won. To claim the winnings I must fill out basic information. If you didn’t purchase a lottery ticket, then there is a very good chance it’s a scam. Don’t give out your personal information (let alone your credit card details! ), because that’s how they get you. You can read more about it here. I have won on Ontario 49. I received an email who said a information about de Lottery but i can’t call someone for claim that money ,i from argentina. Pelase , can you give some number to call or a mail dress? Thank you very much. If you’re from Argentina, I’m assuming you used a lottery site to purchase Ontario 49 tickets? If so, you should contact the lottery site itself. They should be able to help you claim your winnings. If you want to go directly to the source, you can call OLG (the gaming corporation that operates Ontario 49) on this number: 1-800-387-0098. However, if you simply received an email claiming you won, but did not actually purchase an Ontario 49 ticket, be careful! That could be a scam.